1.Heat 1 tablespoon oil in a skillet over medium heat, and saute the onion and garlic until soft. Mix in beans, bell pepper, tomatoes, and corn; cook until heated through. 2.Spread 6 tortillas with equal amounts of the bean and vegetable mixture. Sprinkle with equal amounts of the Cheddar cheese, and top with the remaining tortillas to form quesadillas. 3.Heat 1/4 cup oil in a large skillet over medium-high heat. 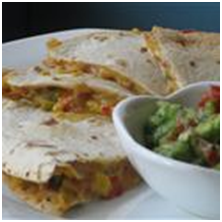 Place quesadillas in the skillet and cook, turning once, until cheese is melted and both sides are lightly browned.